The Chicago Cubs have been holding their breath ever since Willson Contreras injured his hamstring on Wednesday. Contreras has been a catalysts for a recent surge that has put the Cubs atop the NL Central. Fortunately for the Cubs, initial reports from an MRI performed Thursday indicate that the hamstring injury is not season-ending. The Cubs are cautiously optimistic that Contreras will return sometime in September to help Chicago return to the postseason. 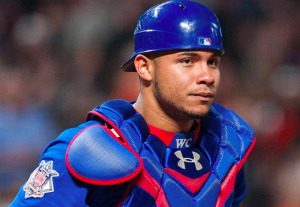 Contreras, who was last week’s National League Player of the Week, was upbeat in a tweet Thursday on his way to the MRI. Meanwhile, Cubs President Theo Epstein declined to put a timeline on the return of Chicago’s young catcher. Outside of the duo of Anthony Rizzo and Kris Bryant, Contreras has been Chicago’s most impactful offensive player this season. In his first full big league season, Contreras is hitting .274 with an OPS of .861. He’s been particularly hot over the past month. Since the all-star break, Contreras is hitting .311 with an OPS of 1.080. The primary replacement for Contreras while he’s out will be Alex Avila. The Cubs picked up Avila at the trade deadline in the same trade that gave them reliever Justin Wilson. He’s been slow to get going in his first few starts. But before the trade, Avila was having an outstanding season with the Tigers, hitting .274 with an OPS of .869. The Cubs will also call on Victor Caratini, who will likely be recalled when Contreras officially goes on the DL Friday. Caratini is average at best behind the plate, but he’s having an outstanding season offensively at triple-A. He was just 5 of 26 with a home run during a stint with the Cubs earlier this season. Of course, the rest of the Cubs players realize that it’ll take more than Avila and Caratini to replace Contreras. Other players will need to step up, considering how much the bat of Contreras has carried the team recently. At the start of the day Friday, the Cubs held a one game lead atop the NL Central. However, it’s not just the Brewers who are chasing them. The Cardinals, Brewers, and Pirates are all within three games of Chicago in the standings. The Cubs can expect to get a lift in September when Contreras returns. But until then, holding off three challengers within their division may be a difficult task if they can’t replace the production of their young catcher.